Setting up your environment for success is one of the best ways to be, well, successful. 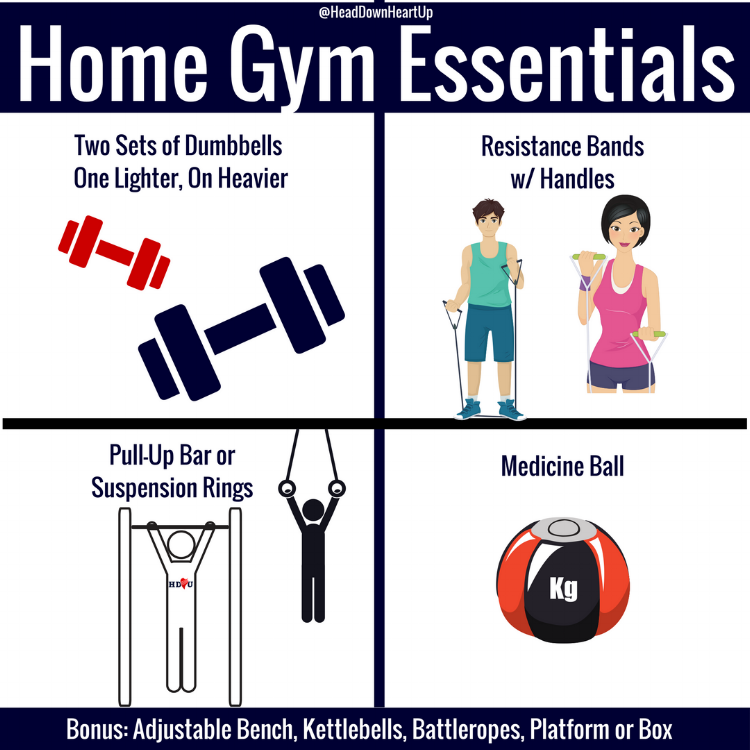 If you're developing a fitness habit or even if you've been consistent for years, having equipment available at home is one of the best ways to make or keep the habit. Now, I'll be honest - you could pick any ONE of these things I’m about to mention and have everything you need to get in some daily movement. I mean, even your own body weight is a full gym in and of itself. That said, having a bit of variety is nice and can prevent the inevitable stagnation and boredom that comes from doing the exact same thing over and over. Now, I chose these "essentials" for the sake of space, ease of use (e.g., easy to learn) and affordability. The last thing you need is an expensive piece of equipment that becomes little more than a clothes rack. You’ll most likely be able to move a lot more weight with your lower body than you will with your upper body. You could certainly increase the volume of your lower body work (e.g., more reps) but your time is usually much better spent if you’re squatting a different weight than you’re curling. Having two sets of dumbbells, one a bit lighter and one a bit heavier, will help with this. What this looks like is going to vary from person to person. That might mean a 10 lb and 20 lb dumbbell. It might also mean a 25 lb and a 50 lb dumbbell. If you’re struggling to figure out which weights to get, let me know, and I’d be happy to help. If you prefer bodyweight training, and I suggest that almost everyone start with mastering the weight of their own body first, a pull-up bar or suspension trainer (rings, TRX (R), etc.) is a must. You can move through all of the fundamental movement patterns without the need of any additional equipment except for the Upper Body Pull (e.g., pull-ups or rows). There are a few other ways to create tension to work the same muscles, but this is the easiest and most efficient way to get this done. Resistance bands are both a great complement and substitute for dumbbells, and you can get a full set of different resistances for around $20. I'm partial to the ones with handles but the ones that look like giant rubber bands work just as well. I will say that I think everyone should have a set of these at their house. I have a set, and I make sure all of my clients do too. Even just one resistance band will give you a little extra something-something during your workout. As a bonus, these are super portable and take up nearly zero space. A weighted medicine ball is a great tool to add some resistance to many different abdominal exercises especially rotational movements like the seated Russian twist. And depending on the quality and durability of your tool, Med Ball Slams are one of my favorites for getting the heart rate up, engaging the entire body, and maybe getting out a little frustration from the day. If you do plan on slamming this thing around, quality is paramount. A steel bell or “pancake” would also be great alternatives to the Medicine Ball but are generally a bit higher on the pricing side. Battle Ropes - probably my top 2 or 3 tools of all time. For what running can do for your endurance and your lower body, ropes can do for your upper body. Although admittedly, they can do a whole lot more and are a ton of fun. These are a fan favorite at Athletic Instinct. Platform - great for building explosive power with box jumps and can also be used for bodyweight dips. Any and all of these will give you a great starting point, and you can always add or remove items based on your budget and desire to do so. I have most of the above along with a full squat rack, barbell, some unconventional tools like a steel mace, steel clubs, and a battle bag as well as a couple of weight vests and a rower. I realize that the only thing I don’t have is a medicine ball (which is absurd considering how much I like med ball slams) but I can slam around my battle bag when the feeling strikes. I didn't buy all of this all at once and slowly built (and to continue to grow) up my arsenal. Since fitness is a big part of my life both personally and professionally, it makes sense for me to have more equipment. So, please don't think you NEED to go out and get all of that. Build out your foundation, get really good with what you have, then expand when it makes sense. And if you are looking to expand, enter your email address below, and when it’s ready, I’ll personally send you my Advanced Home Gym Essentials Guide. This guide will look at a broader range of tools both conventional and unconventional and focus on their benefits, why you might want to include these in your home gym, and where to get them. Note: This article was inspired by the Home Gym Equipment Essentials episode of the HDHU FitFood Show.